The method for cutting billets is cutting from up to down. This extrusion press hot log shear has the function of aluminum billet saw and operates in coordination with LPG direct fire billet heating furnace. You can adjust the length of billet quickly and do all the processes at one time. Thus, it can save manpower cost for cutting aluminum billet. The rest aluminum billet can be connected to next billet so it can retrench loss of 5mm billet each time. Thus, there will be no waste material. You can change different quality of aluminum billets which are the same size as you wish. You do not need to change shear blade. Thus, you can retrench operating time. Extrusion press hot log shear can heat from normal temperature to operating temperature in a short time and can retrench gas consumption effectively. 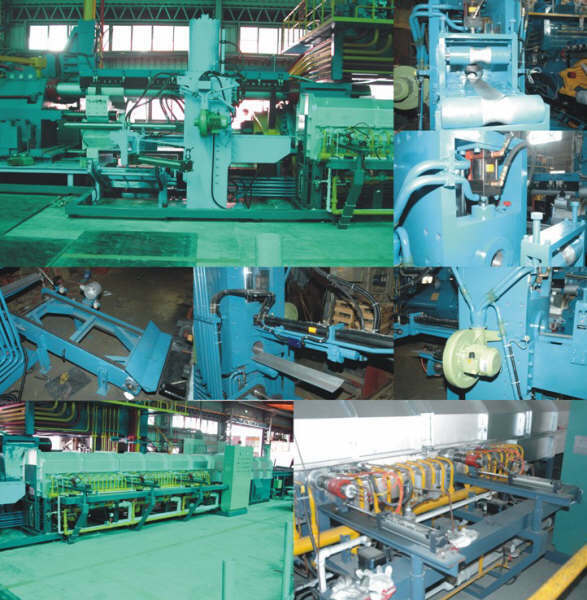 The extrusion press hot log shear is an automatic sensor equipment. The light will be on when there is no billet on shelf. Copyright © Yuen-Sun Machinery Co., Ltd. All Rights Reserved. Designed by Renu Internet Information Co., Ltd.